Settlers of Catan, the award-winning resource-allocation and strategy board game, will have a version on the iPhone and iPod Touch "this summer," developed in conjunction with Catan's creator, according to the game's official website. An announcement on the Community & News board of the official Web site Catan.com declared today that "the game is being developed by Exozet Games in collaboration with Catan designer Klaus Teuber." It will be published by United Soft Media. 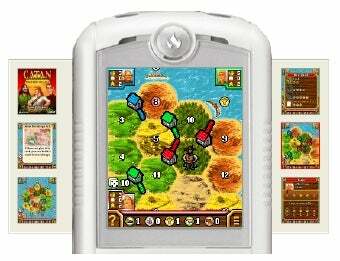 Exozet was also responsible for last year's Catan, the First Island on handset mobiles (pictured). As an iPhone owner and a recent convert to Catan - my friends here in Oregon play it obsessively - I'm delighted by the news. Perhaps this won't be as social as the tabletop game, as trading makes up a good chunk of the decisions until someone gets squarely in the lead. But it's still one of the more thought-provoking strategy games out there, video or otherwise. My newbie advice - go for the 3:1 trading ports, build the longest road - with no more than one spur - instead of the largest army, and squat on ore if its dice number is favorable.